Horizons looks to be mostly residential to me. I’ve spent a little time there, mostly wandering around or visiting the Cafe D’Art when it was in existence. 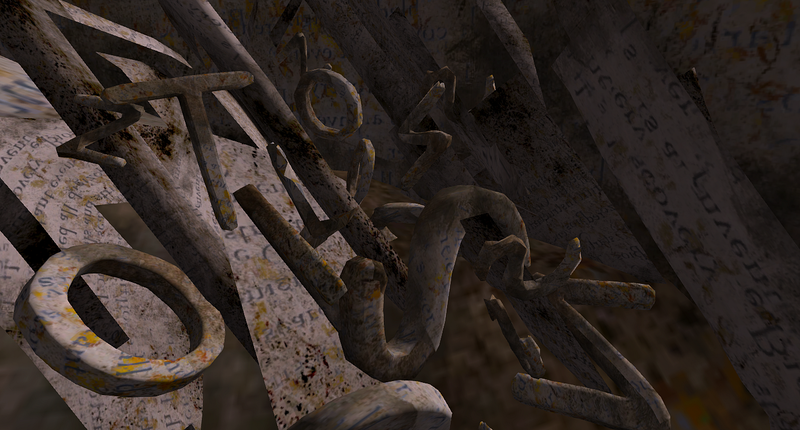 In Horizons Andromeda, Coping Mechanisms, is a 1024 parcel well worth exploring. Some of the stacked storage containers are open. There are carefully chosen items stashed inside. Outside, you can bounce on the trampoline, with a miniature cardboard house and a giant avocado nearby. An opening in the fence allows you to wander over to the parcel next door, owned by the group, Innocent Young Throat-Cutters. 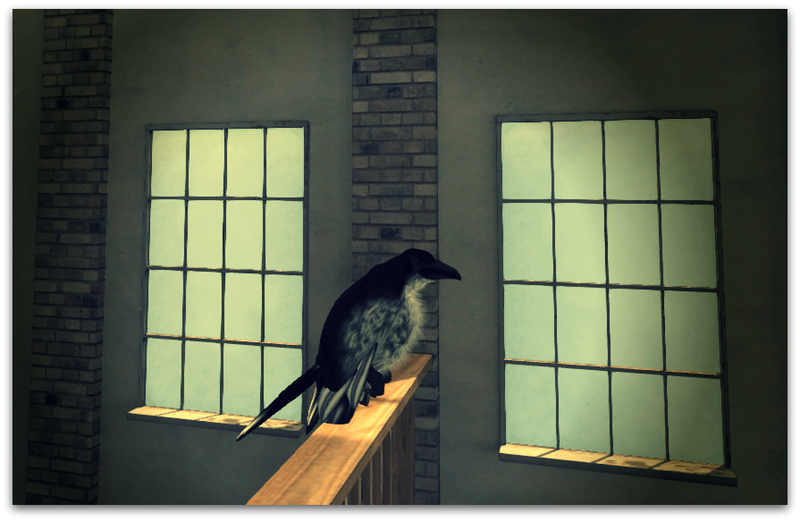 These photos were taken with the windlight of the sim; Andromeda is A rated. Click on things when you’re there. Coping Mechanisms is the creation of Art Oluja; those familiar with her work will recognize remnants of some previous installations. Some art pieces from her personal collection are on view as well. When you arrive, you may want to grab a landmark for your inventory. 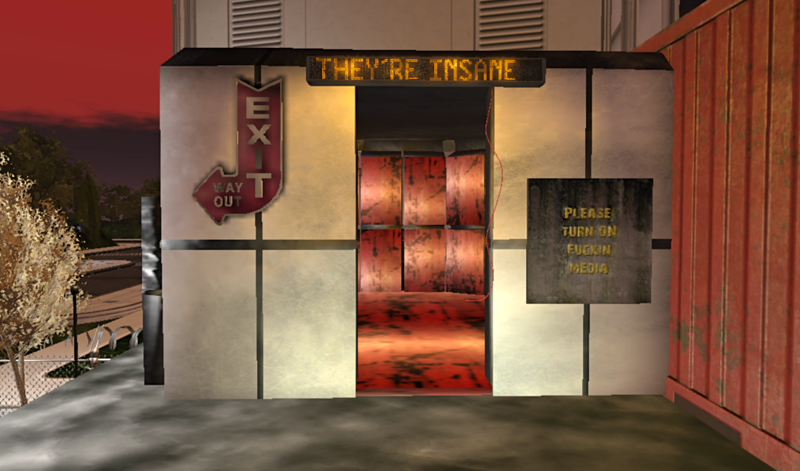 The LM is to aid your escape from the padded room, should you choose to wander in. 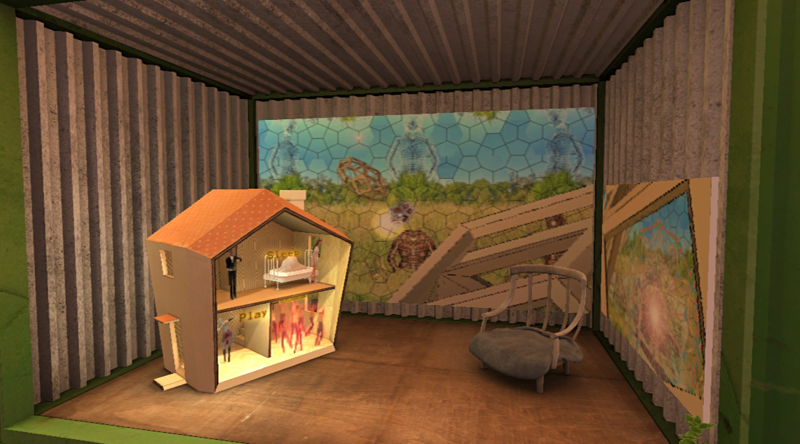 Enable media for an immersive experience. Be patient; media usually doesn’t work for me and I found this worth any wait. The padded room was originally installed in the opening exhibit at the club/gallery/refuge, Blush Response. 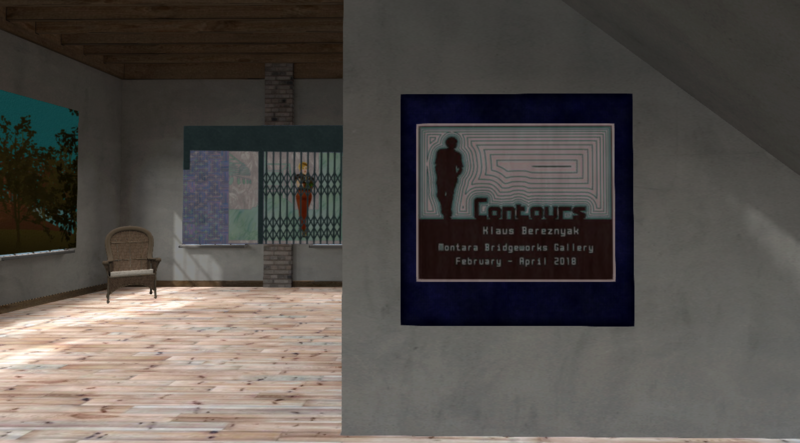 The February through April exhibit at Montara Bridge Works Gallery is Contours by Klaus Bereznyak. Shoshin Acres Art Space. 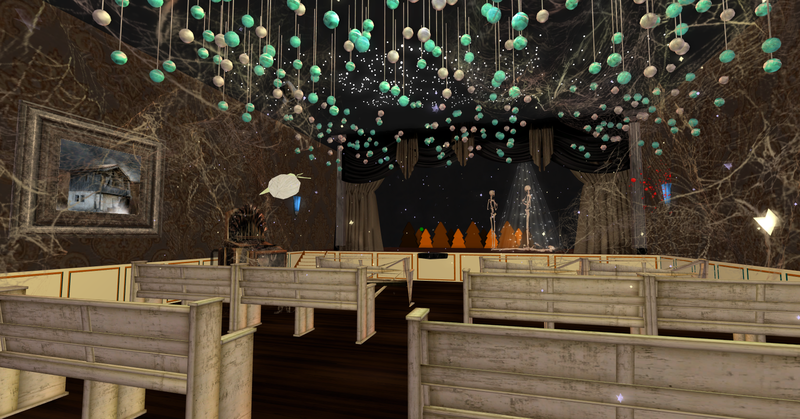 He has exhibited at Chelsea Gallery 23 and The Cultured Goats Gallery, participated in numerous collaborations and group projects and is a freelance contributor to SL Newser. Autumn season is well underway in Olde Lapara Towne. Halloween decorations are scattered about to just the right degree. I first discovered the town several years ago while riding the train on The Atoll during the winter. It travels right past. 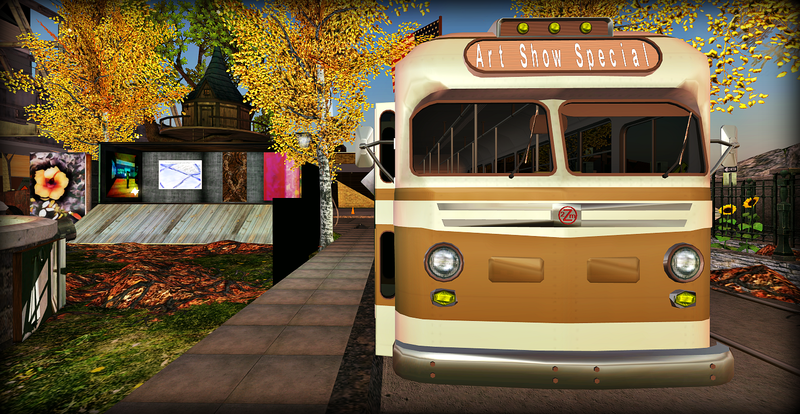 In one of the parks, the Wanderlust Art Truck has camped for the month of October. This is the 11th stop on the tour which began in March of this year. The landing is in a small gallery with directions to the nearby park. 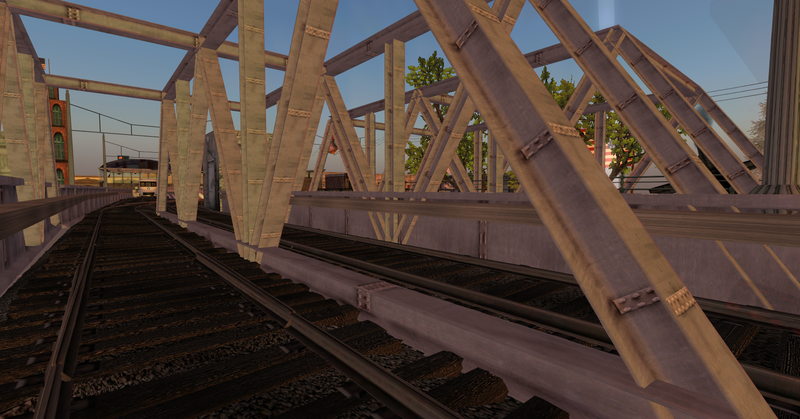 Here is a view looking in the direction of the train tracks. 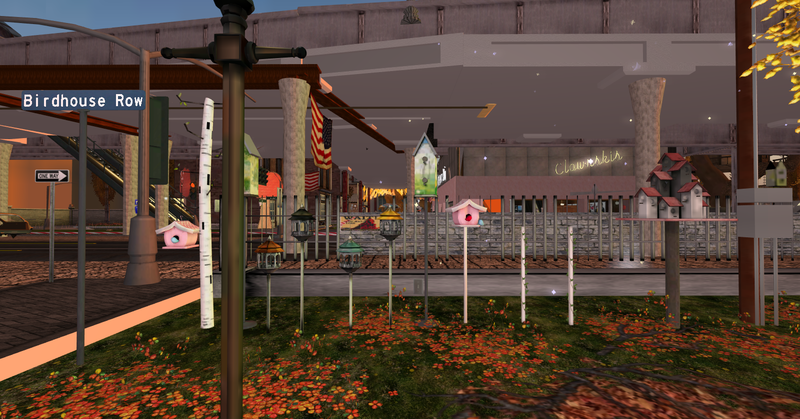 “Old Lapara Towne is the best city on Second Life. We are located at the top of the atoll, near the mainlands highest peaks. The town is seven years old, consists of four layers, including subway and elevated rail lines, plenty of roads, parks, buildings, and walking trails. There is much more detailed information on the Olde Lapara Towne website. The photo above was taken on the upper level of Clownski’s Window Art. You can do a Viennese Waltz and then get something to eat. 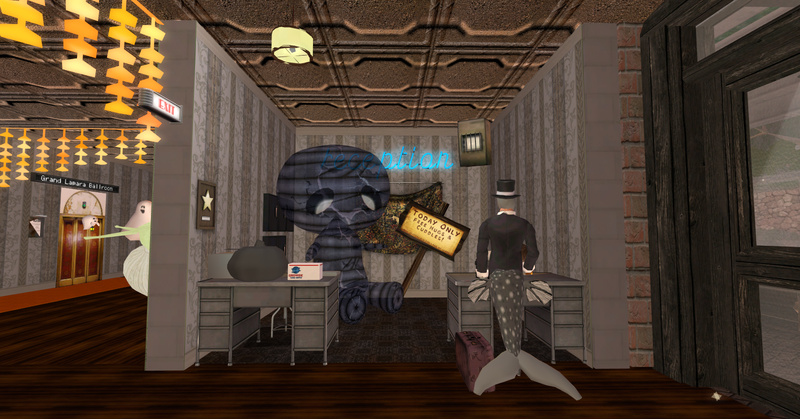 Lapara continues to be an inspiration for creativity for other avatars, including as a subject for several blog posts by Veyot. Olde Lapara Towne has also been a main setting for a graphic novel just completed in September by baker Bloch. A page with six links to each of the six parts can be found here. The Bodega Market on the southwest corner of the town currently holds a collection of collages by baker, on exhibit now. “Red door bar in back. The infrastructure in Lapara is amazing. 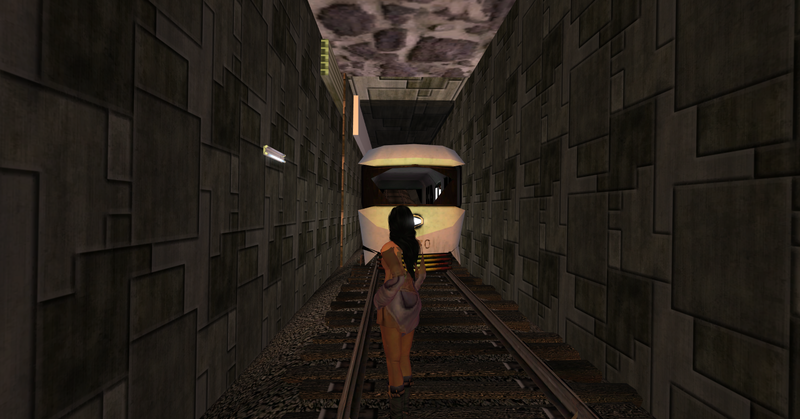 There are numerous vehicles and ambient sounds, including Halloween for the season. If you get lost, just hop into one of the many moving vehicles. 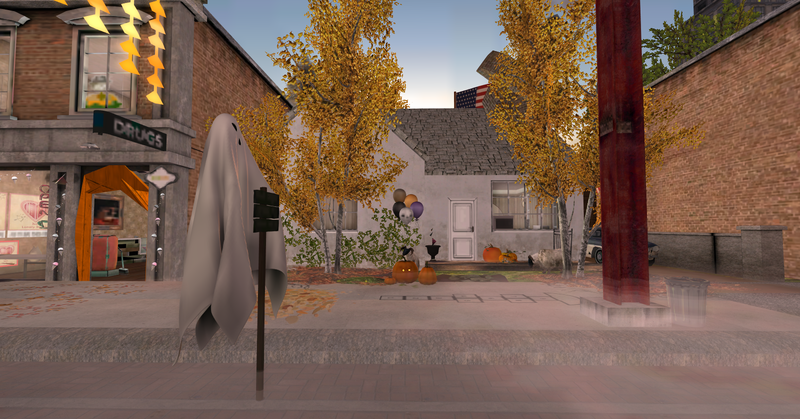 Olde Lapara Towne is a fine example of the imagination and dedication of Second Life avatars that I so admire. There’s much to see here; make some time to let things rez. I will be filming for the documentary series I’m doing for all the stops on the Wanderlust Art Truck tour at various times throughout the month. Volunteer actors welcome. Recently opening September fifth, Here’s Looking at You by Quinn is the exhibit at Montara Bridge Works through October. 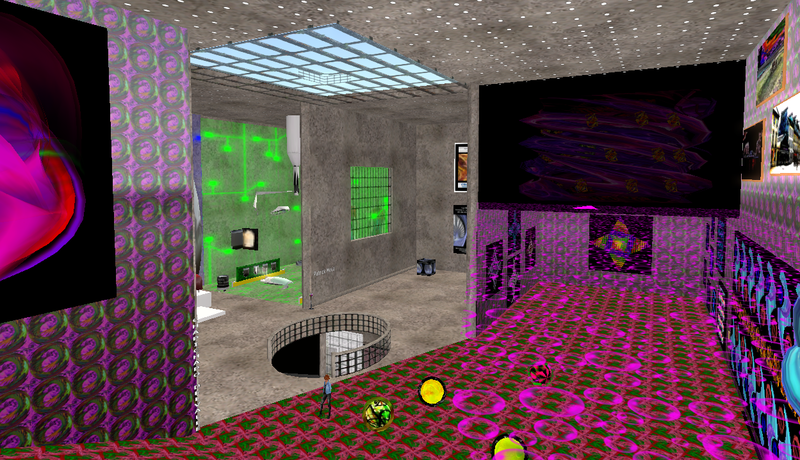 The second floor, shown above, contains Quinn’s earlier works, some from when the elusive corvid was still an egg. The ground floor of the gallery exhibits more recent photos from his travels. 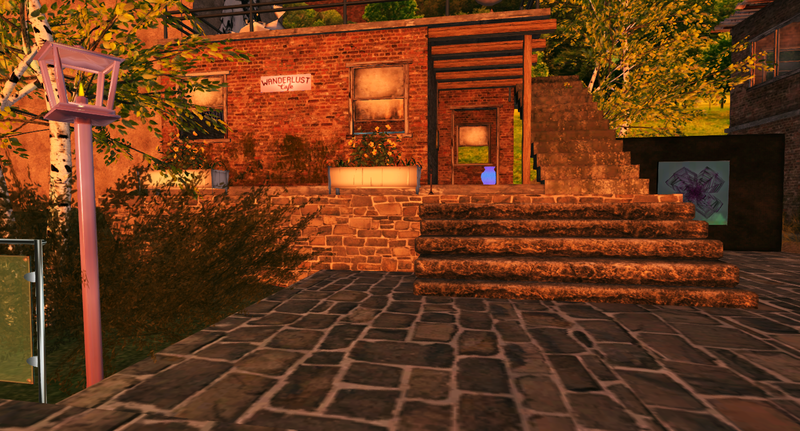 Quinn is the owner of the 512 parcel in Quentin where Wanderlust Bench Art Park is located. He generously offered it during an experiment with a premium account in March 2016 and the space is still thriving. Many of these pieces have been exhibited there one at a time. He moved his birdhouse to Wanderlust some months after the park and Saul Goodie’s adjacent Wanderlust Cafe opened. 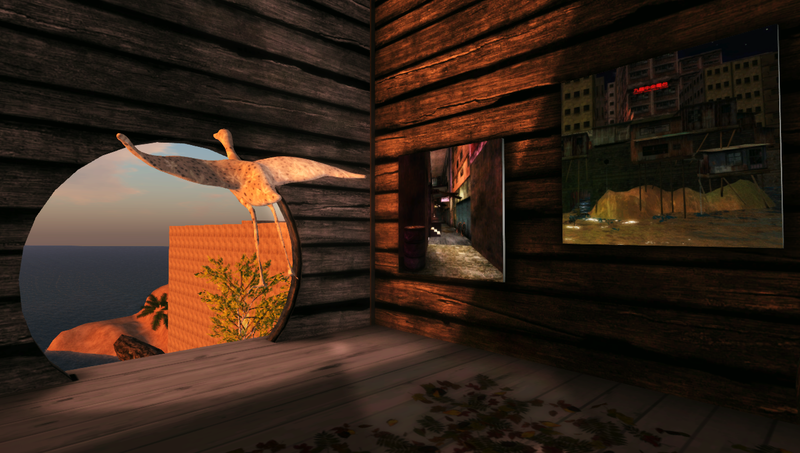 The birdhouse is currently showing art by serra Qendra. Quinn has also experimented with black and white photography. He wanted the exhibit to be titled “Here’s Looking at You, Roadkill”, which is the title of one of the works. As curator, I vetoed the idea since it doesn’t reflect the whole body of work. 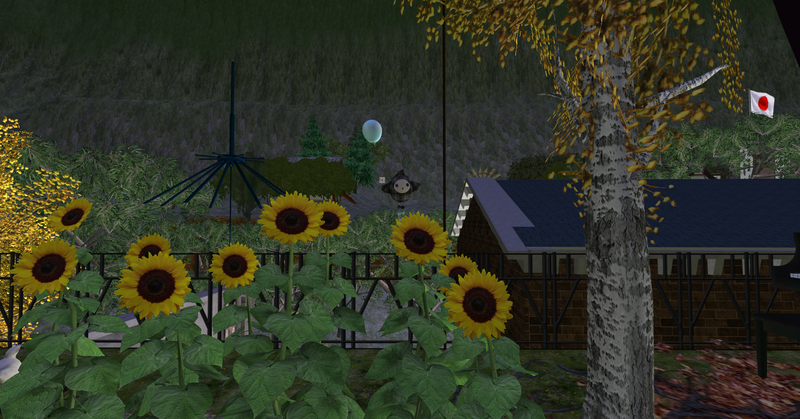 Quinn participated at Art Farm, an LEA sim in the latter half of 2015. Kultivate’s Black and White Exhibition opened August 27 and will continue through September 3rd. 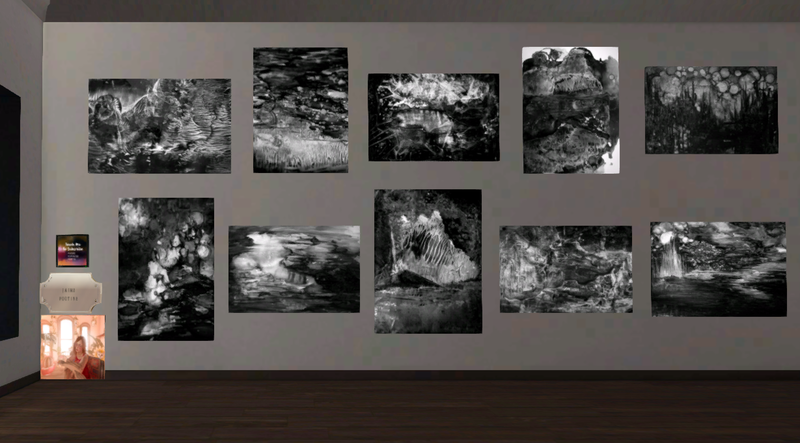 It features black and white imagery from about 40 artists. The photo above shows 2D pieces by Elle Thorkveld. Like Elle, Jaime Poutine often works with vibrant colors. 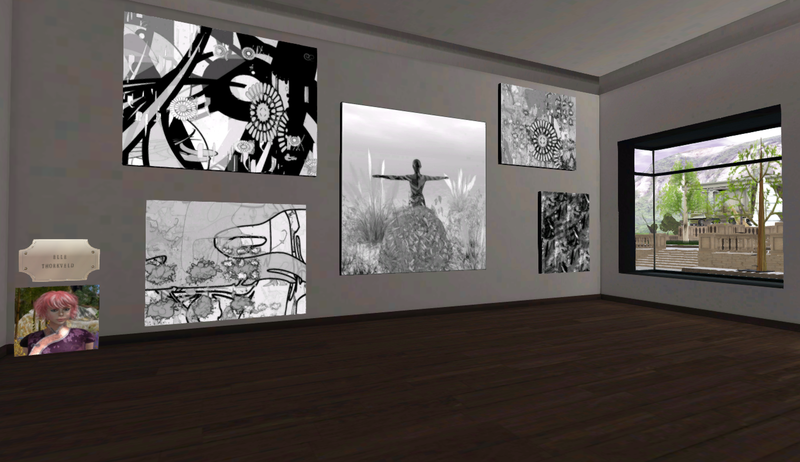 I found these black and white images quite interesting, looking better inworld than in my photo here. For a complete list of artists and a schedule of events check the Kultivate blog post. There’s also 3D works. The piece above is by Eleseren Brianna. I like the way the trees frame the galleries in the background. A Yin Yang Hunt has been mentioned but during my visit I didn’t notice one symbol. 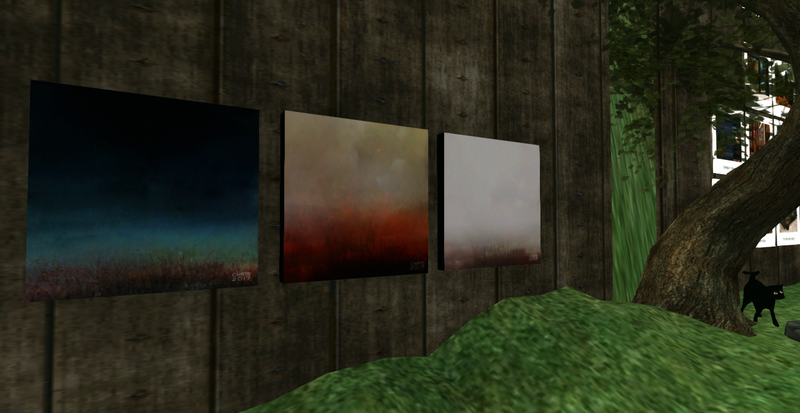 Some of the pieces by Myra Wildmist are shown in the photo above. A few of the exhibitors are showing drawings. I especially like the ones by Sheba Blitz, shown above. There is still time to visit the summer exhibit at Wanderlust in Quentin. 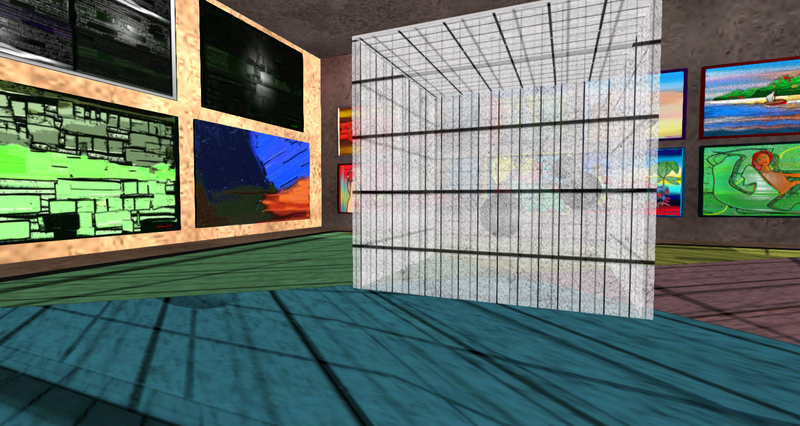 The above photo, snapped in the birdhouse, shows 2D work by the avatar who started it all, Mr Kaplan, (Quinn Leilani). The biggest creative changes to Wanderlust were prompted by “the neighbors”. In SL, as in RL, adaptation is important. WANDERLUST Cafe owner Saul Goodie did an awesome renovation of the parcel while keeping the vibe and spirit of the art collective and destination space. There remains outdoor seating plus a quiet indoor cafe area with more space on the roof top. 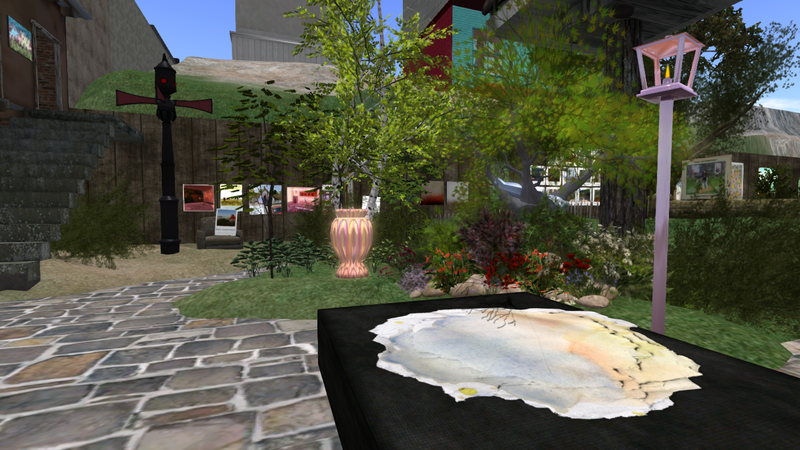 The rooftop currently holds several works by Elle Thorkveld. 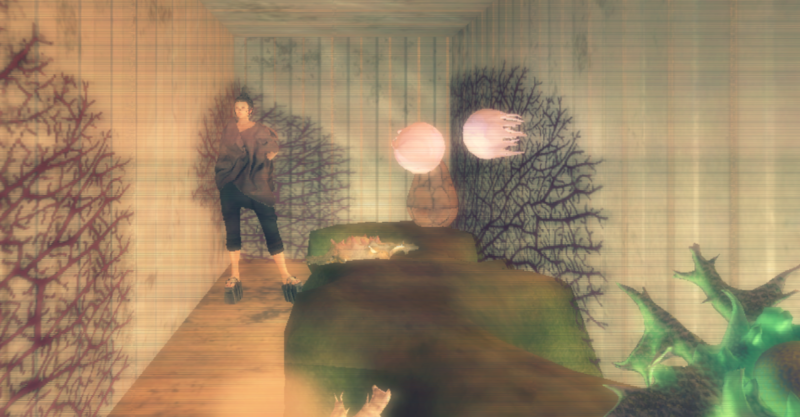 A nearby building exhibits both 2D and 3D works by four avatars. 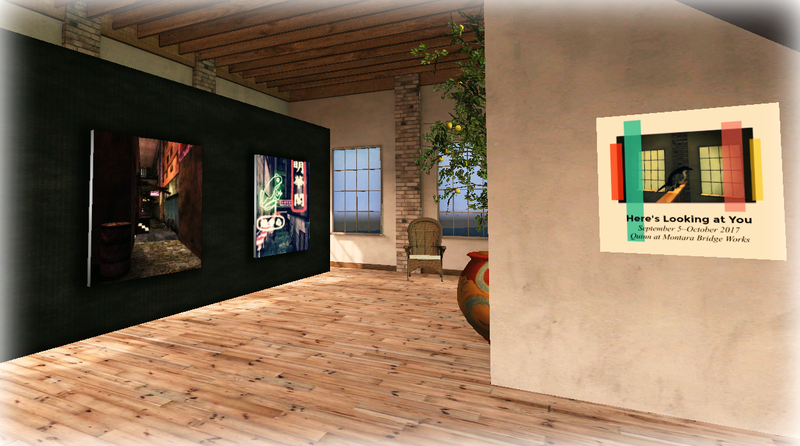 Shown above are pieces by Klaus in the foreground and art by Giselle Seeker on the wall. 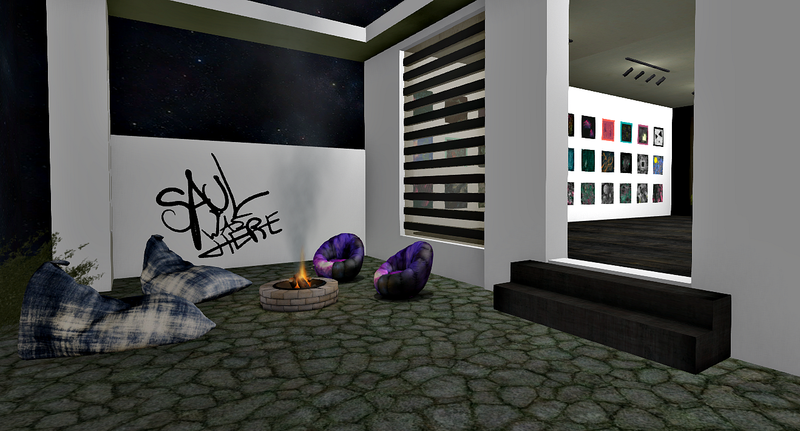 The second level houses Art by Saul. Outside this building is a Victorian Crossing Signal from Ying Industries. The park side has a Tesla Wireless Phone, also from Ying Industries, displayed on a pedestal. 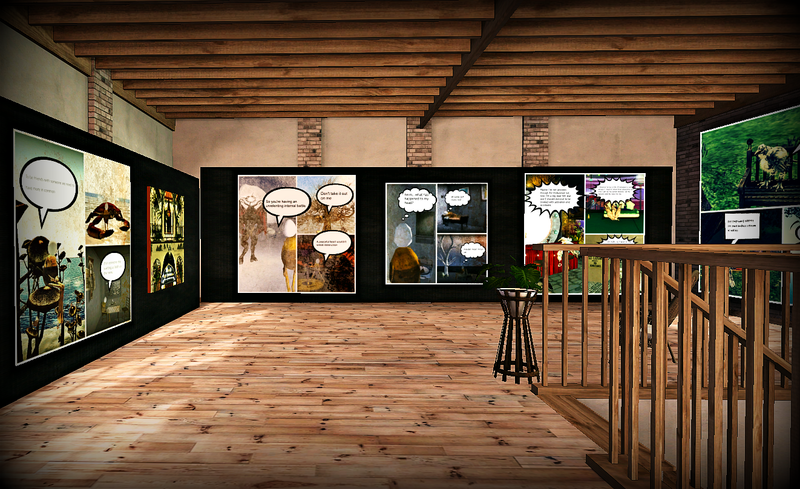 A couple of the pieces shown on the Cafe side were originally in the Glass Jars Keepsakes Contest. The lovely piece in the foreground is by Olive. 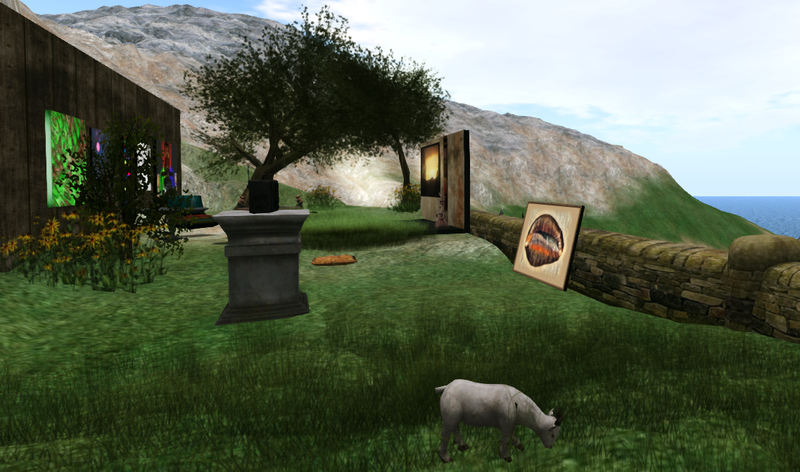 In the center of the photo is a vase by Lynette Trinity, an ongoing contributor. On the park side, a photograph by new contributor Adrianna Biziou. Usually I keep my draw distance down for photographing the Art Park. The red and white lighthouse, a landmark that has been in this view since way before the park has been here is gone, the land abandoned. Also gone is the imposing castle with the dragon family. That land is for sale along with several other parcels in the area. 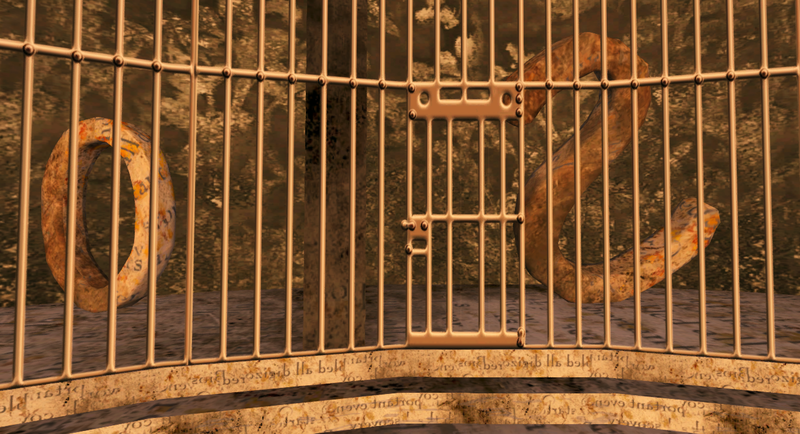 The art propped up against the stone fence is by Klaus, with a timely notecarded thought. Above, 2D pieces from left to right by Klaus, Kate Silver, Saul Goodie, Lynette Trinity, Elle Thorkveld and baker Bloch. 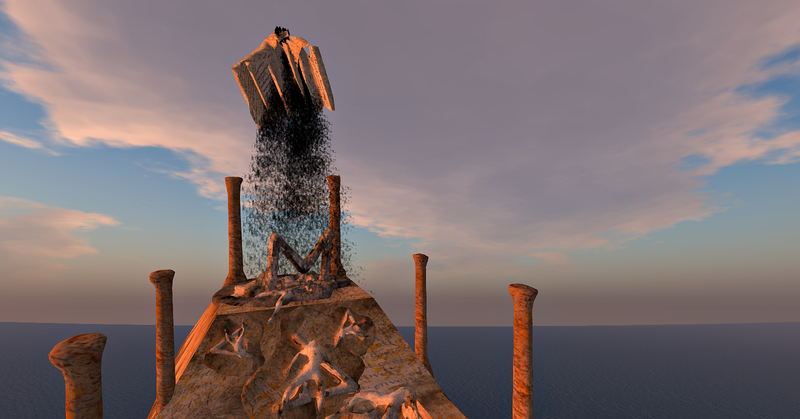 Pieces by contributors, ChrysTeRox, serra Qendra, Melusina Parkin and Wheedle. At Split Screen Installation Space through the end of April is Bleeding Books by Haveit Neox. Bleeding Books opened on March 4th. 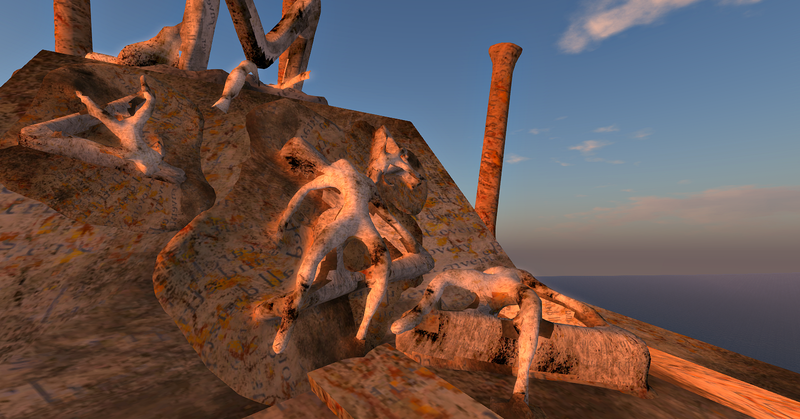 Le Petite Cirque is a collection of sculptures by the artist knows as Silas Merlin in Second Life. There are 12 pieces, 10 of them shown here. They are available from a gacha at The Chapter Four until March 21. After that, they will be available at The Silas Gallery. The gacha for these at The Chapter Four is in the door to the left after you land and walk towards the event. Once inside, the vendor will be the second one to your right. The sculptures can be modified for size. 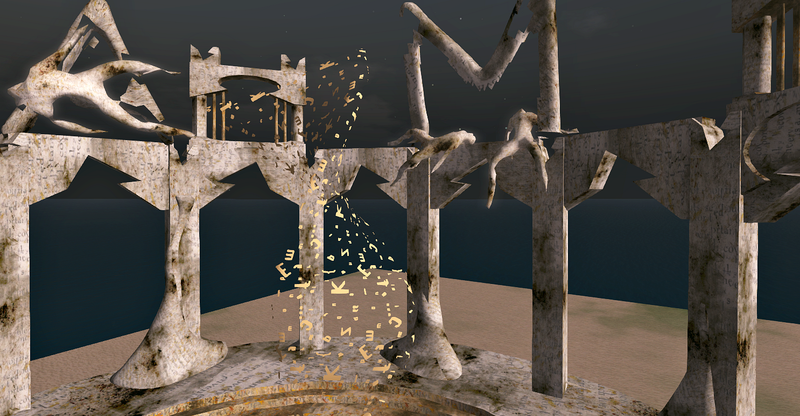 Some of these can be seen inworld at Wanderlust Bench Art Park until the end of April and a few more are rezzed at Elle’s Art Lot for a few weeks. The sculptures exhibit the usual beautiful attention to detail. 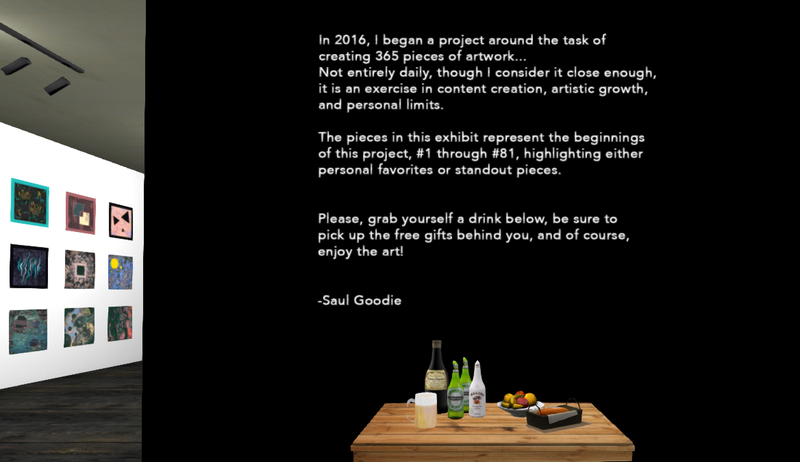 Now open through April, Art by Saul is an exhibit of graphic art by Saul Goodie. 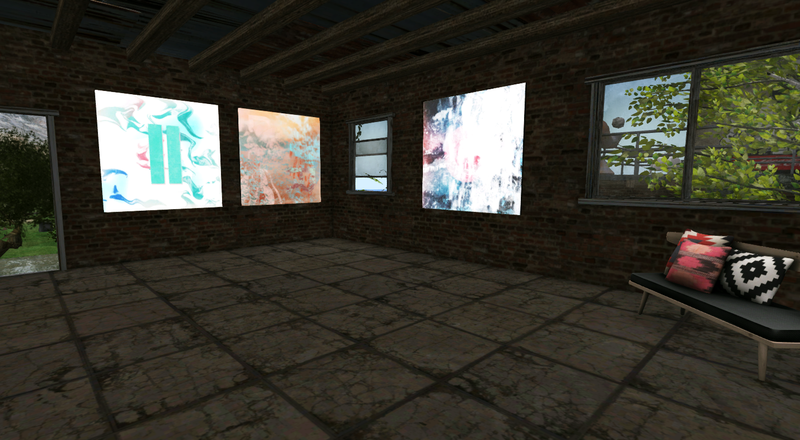 “NOTE: The artwork is displayed in no order other than arbitrary complementing, not in Chronological order. 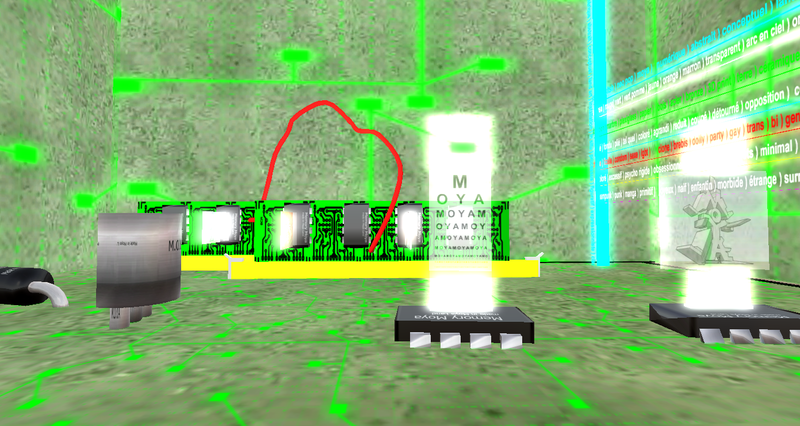 In addition, the pieces are un-marked, as I felt having the numbers displayed brought nothing to the experience. 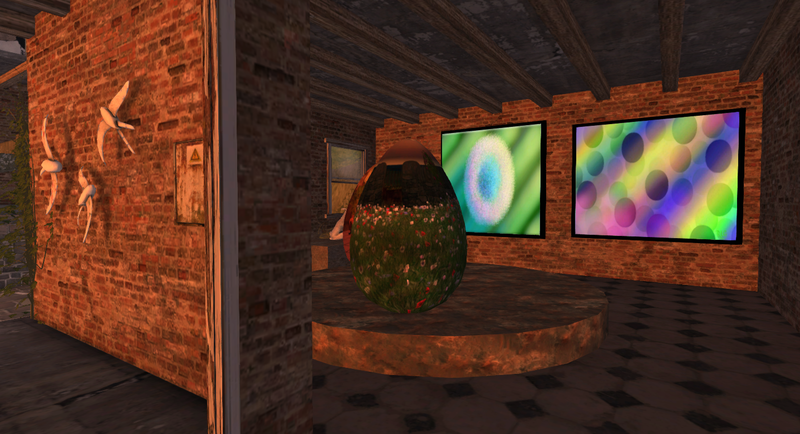 There is a teleporter connecting the exhibit with Wanderlust Cafe below where more of Saul’s art is shown. 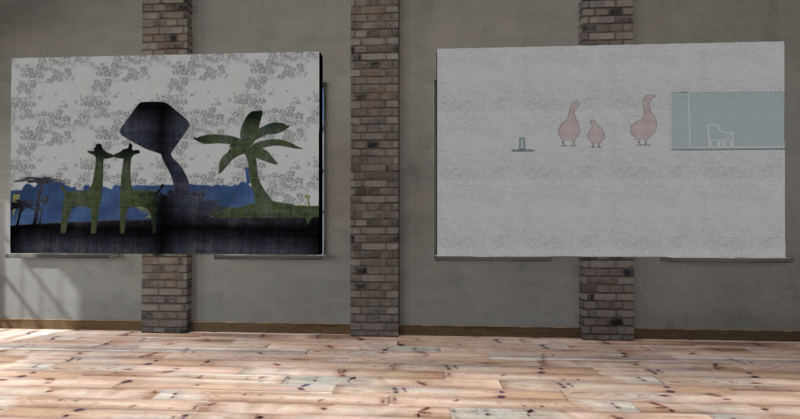 Just opened March first, works of five artists are exhibited on two floors at La Maison d’Aneli, Virtual Holland. The photo above shows a view of the top floor. 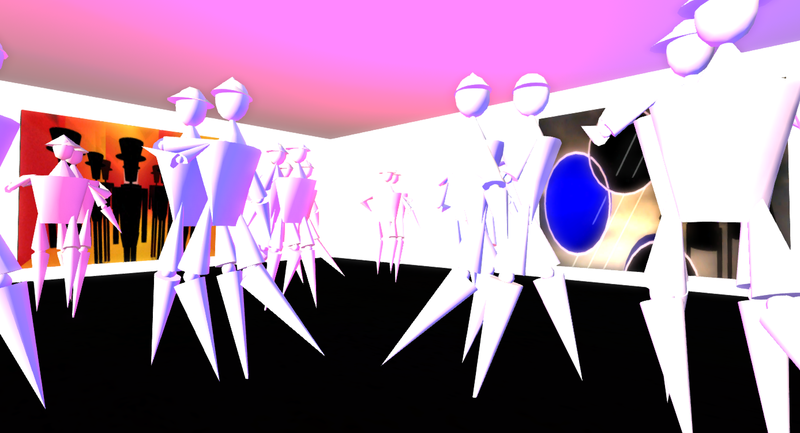 When you land at the Cafe, you’ll find all the seats taken by characters such as the ones above but you can dance. 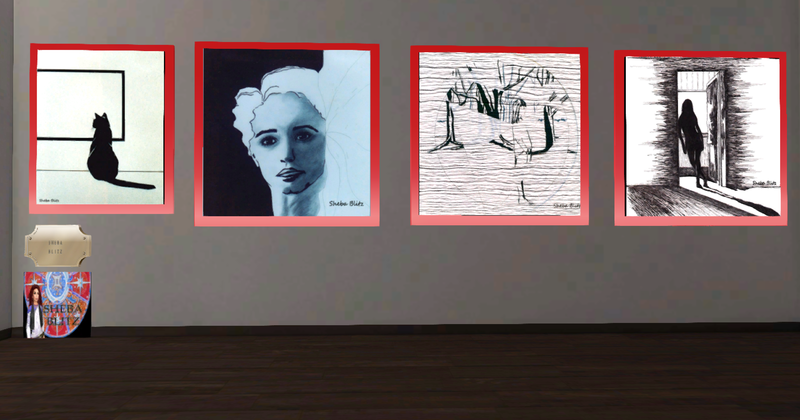 Displayed on the walls of this room are works by Aloisio Congrejo. 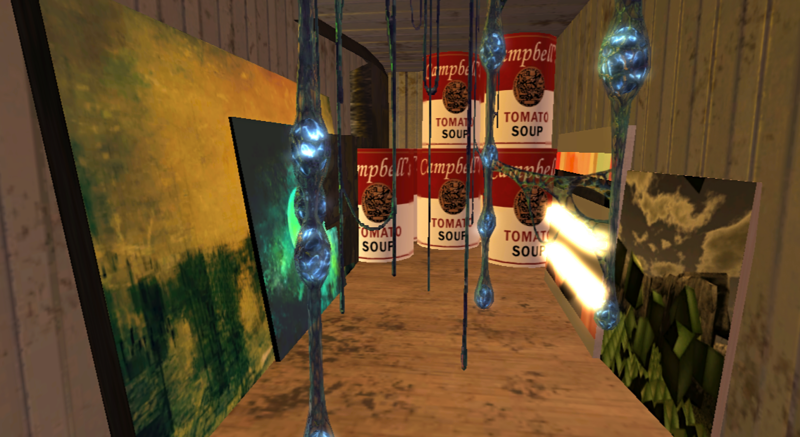 You can teleport in and out of the art. The paintings by Tubal Amiot are a great find for art collectors, being excellent pieces plus very affordable. At Mod, no copy, Transfer they also make great gifts. I can see them as a focal point in a room by people who love to decorate and don’t especially want to have a lot of art around. Art by Patrick Moya is upstairs. Bright and animated pieces by Chapichapo Delvalle are also very affordably priced. A ramp leads to a better view of pictures on the upper level. 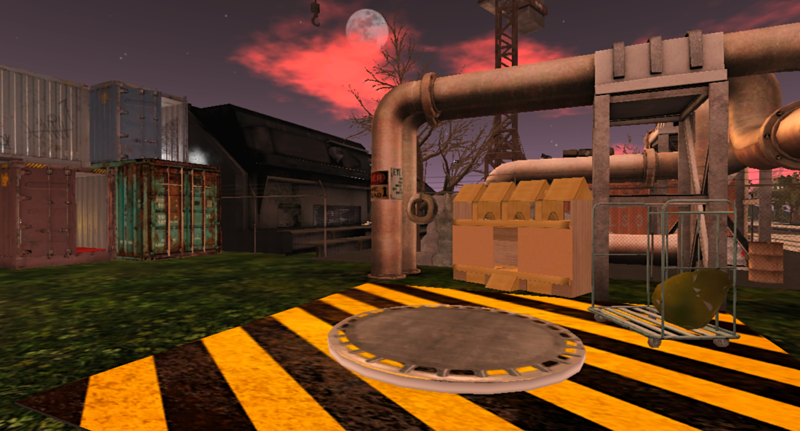 I noticed that I had little trouble with my graphics here which was surprising since I was finding much of Second Life crashy with very slow rezzing just earlier. These photos are cropped and otherwise raw. Your eyes would need a rest at some point but the graphics might not be as challenging as one would think.